After stirring, it changed colors a little bit. 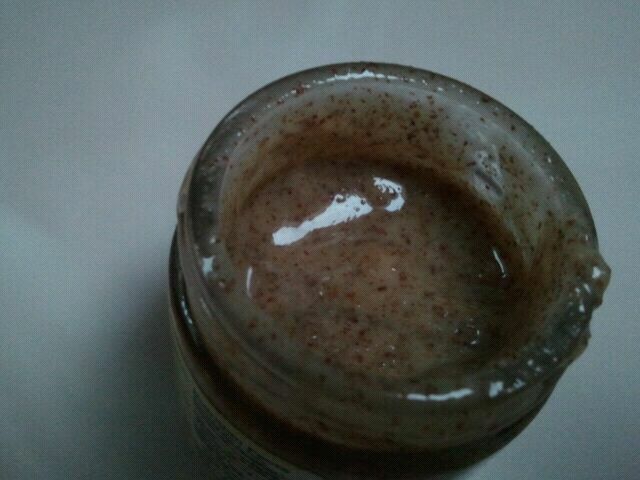 There were brown speckles that looked almost like a bunch of cinnamon was waiting on the bottom of the jar. I figured it was the brown coating of almonds that had settled. 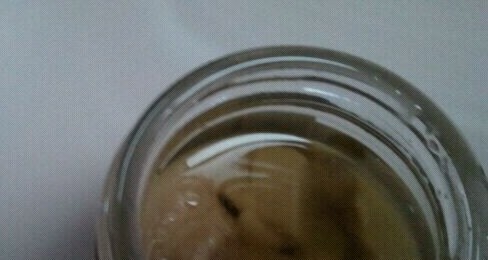 After mixing, the almond butter was fluid like, but not super runny. I took a taste of it and…..just as I suspected. Bland. But that wasn’t necessarily a bad thing. It had texture, it was a bit grainy but also smooth. It literally tasted just like raw almonds do, and nothing else. Not a hint of salt, or sweetness really. I kind of liked it was raw, so that I could smear it on toast and drizzle with honey, or add a pinch of salt to suit my preferences. I wouldn’t say this would replace my consumption of roasted almond butters or peanut butters, but it was certainly different. If you like the taste of raw almonds, you might dig this. Me on the other hand, I like my almonds roasted, salted, and seasoned. 2 1/2 stars for me. The nutritional fact on this little (but SO CUTE) jars was too tiny to see, so heres the basics. 1 tbsp is 94 calories, 8 grams of fat, 3 carbohydrates, 2 grams of fiber, 1 gram of sugar and 4 grams of protein. How do you like your almonds? Raw? Candy coated? Let me know! I got this jar as a free sample. My opinion remains unchanged and unaffected regardless of the fact that it was free. 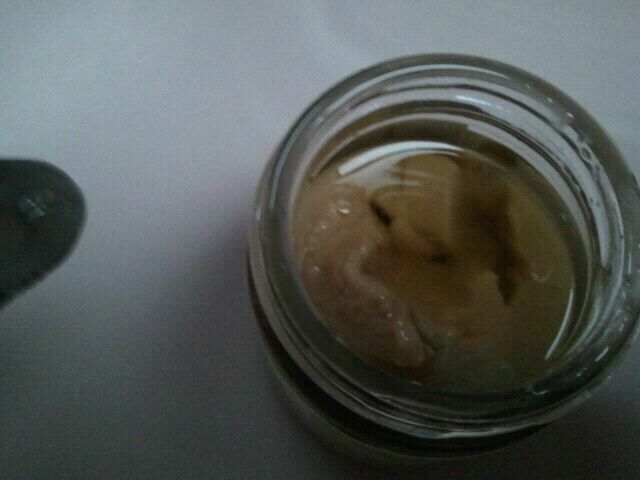 I opened up the jar and saw a pale beige colored nut butter, which sort of resembled a paste. It was thick when I stirred it, but had a very smooth consistency. The taste was excellent. Very creamy, pure and light tasting. Slightly sweet and slightly buttery, and had a very clean cashew flavor. 1 Tbsp. is 92 Calories, 8 grams of fat, 4 grams of carbohydrates, 1 gram of fiber, 1 gram of sugar and 3 grams of protein. Artisana– a company that makes a bunch of nut butters. BUT- these nut butters offer a little something special. They are all raw, organic, and don’t contain any bad fillers or preservatives. 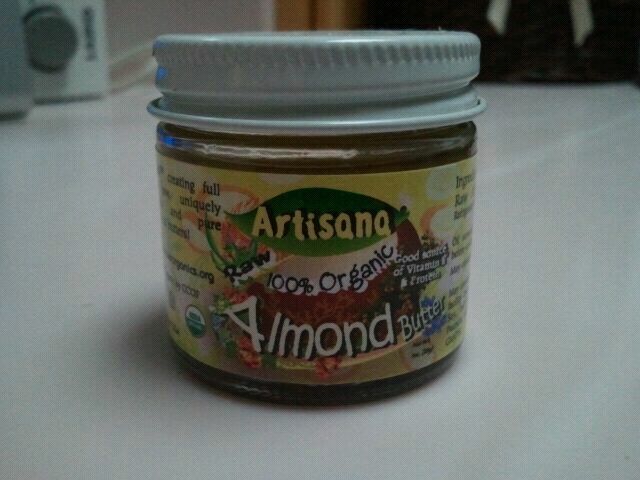 Artisana sent me a couple of their nut butters to sample (in the CUTEST little jars that have about 1 Tbsp. of each nut butter in the jar! ), and I was excited, actually. 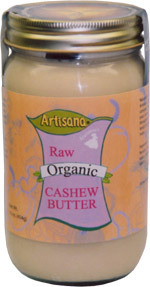 I haven’t had a lot of raw nut butters- I usually have the flavored nut butters, or the all natural ones. One of the jars I was sent is the Cacao Bliss Chocolate Coconut Butter. Yum. This sounds liek a mix of tropical and chocolatey delight. According to the website, “Finally! A vegan and sugar cane free, rich, creamy chocolaty coconut spreadable nectar. Indulge guiltlessly with pure Organic, raw ingredients of the highest quality. Artisana™ – Chocolate Is a dreamy and delicious delight – melts in your mouth in sweet celebration while also giving you real energy and nutrition. I opened up my mini jar, and was actually a little surprise. This nut butter was kind of, err, stiff. It reccommends NOT to refrigerate it, actually. I wonder why it’s so stiff, as I’m used to very supple and smooth nut butters. Anyway- I tasted a little bit of it- not bad! You can definitely taste the coconut, which is nice, with a mild blend of chocolate/cocoa flavor. It was almost a “melt in your mouth” consistensy- and almost “cool” in flavor. Bizarre- but quite good! It’s not that sweet, so if you are used to sugary spreads, you might be a little shocked with this one. However, I liked it. I think it would be great mixed in with oatmeal, on toast, or even with a banana (or maybe just a mini spoon and my mini jar!!). Overall, I give it 3 1/2 stars. It lacks protein, which is one of the reasons I eat nut butters, but I think it’s quite good for a “dessert” spread- and you can reap up some benefits of coconut as well! It wasn’t as sweet as I had hoped, but, sometimes less is better! This one is also gluten, peanut, and dairy free! 1 Tbsp is 89 calories, 8 grams of fat (7 saturated), 4 carbohydrates, 2 grams of fiber, 2 grams of sugar, and 1 gram of protein. 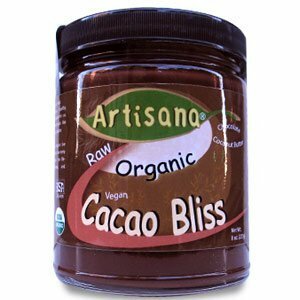 Artisana™ Organic Raw Coconut Butter, Organic Raw Coconut Oil, Organic Raw Agave Syrup, Organic Raw Cacao, Organic Raw Cacao Butter. Dont forget about the newly posted NUTRIDEL giveaway! Woooohooo! !